Stallholders at the local market make these skewers and cook them over charcoal braziers. They are then sold rolled in flatbreads with handfuls of herbs and chopped onion stuffed inside. These are an interpretation of the wonderful street food snacks. 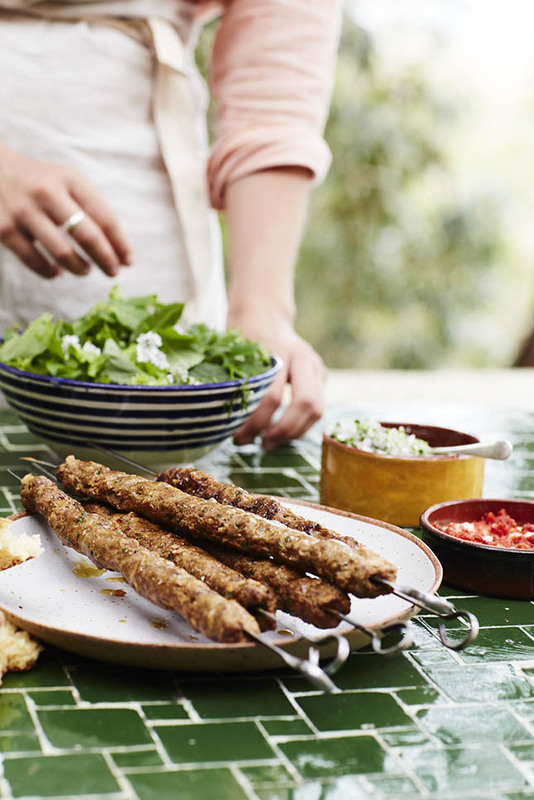 You will need 6-12 metal skewers, or you can use wooden ones, but make sure they are soaked for at least 15 minutes in water beforehand to stop them singeing. Put the minced lamb into a large bowl with all the other kefte ingredients and mix well: this is best done with your hands so you can really get all the spices and flavours incorporated into the meat. Take a small handful of mince in the palm of your hand and shape it into a long sausage shape around the skewer. Press it quite firmly to make it adhere to the skewer. You could make either one large skewer, or two thinner skewers per person. Cover and refrigerate for at least 30 minutes. For the herb salad: put the herb leaves and onion into a bowl. Mix up the other ingredients to make a dressing and just before serving, dress the leaves and toss well. Mix all the ingredients together and refrigerate until needed. Cook the skewers under a medium grill (or on a griddle pan or barbeque) for 2-4 minutes on each side (depending on their thickness, try not to overcook them or they will dry out). Serve while still hot with the herb salad, cumin harissa yoghurt and warmed flatbread.